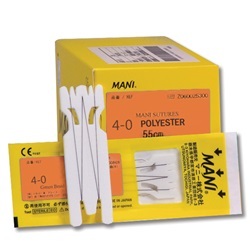 Mani brand 4-0, green or white braided, polyester sutures with double arms. Trape spatula and dia spatula needles ranging in length, curve, and diameter. Mani sutures are ideal for micro-suturing on the cornea and sclera during eye surgery. Ultimate sharpness is obtained through the "cross-lapped edge" technique giving each suture a fine and sharp tip ensuring minimally invasive wound closure. 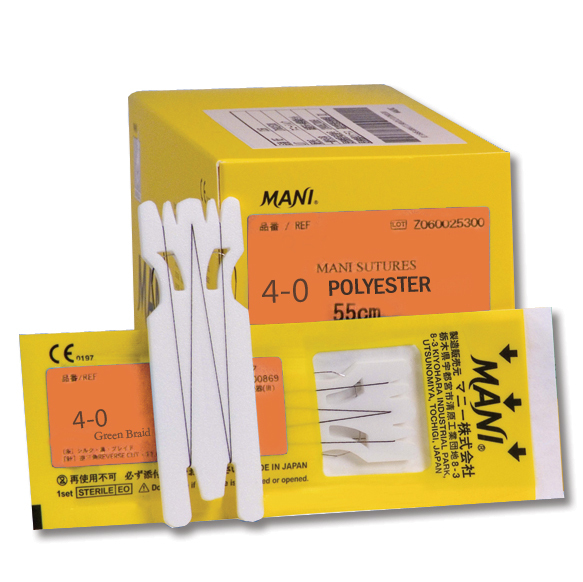 Mani hard fiber stainless steel is used to make strong and break-resistant needles. Sold 12 per box. White braided, double-armed suture, measures 45cm in length. Trape spatula needle, measures 8.0mm in length, 1/4 curve, and 0.43mm in diameter. Green braided, double-armed suture, measures 45cm in length. Trape spatula needle, measures 8.0mm in length, 1/4 curve, and 0.43mm in diameter. White braided, double-armed suture, measures 45cm in length. Dia spatula needle, measures 8.0mm in length, 1/4 curve, and 0.43mm in diameter. White braided, double-armed suture, measures 45cm in length. Dia spatula needle, measures 6.5mm in length, 1/4 curve, and 0.43mm in diameter. Green braided, double-armed suture, measures 45cm in length. Dia spatula needle, measures 8.0mm in length, 1/4 curve, and 0.43mm in diameter.